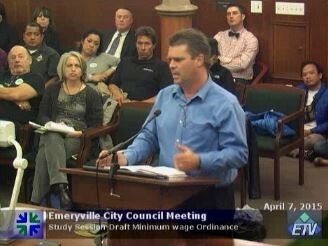 Denny's regional manager William Woods speaking to the Emeryville City Council. Kent Wong, director of the UCLA Labor Center, told the Express that there was no west Los Angeles minimum wage increase. On the contrary, Woods appears to have been talking about the $15.37 an hour minimum wage for employees of big Los Angeles hotels approved last September. But according to Wong, that minimum wage measure boosted wages for employees across Los Angeles in the downtown, Hollywood, around LAX and in many parts of the city. There was also a racial subtext to Woods' claim. According to Woods, crime went up in the areas with the new minimum wage because a “crime element” from Black and Latino areas moved in to prey on the enriched workers. Each of the cities and neighborhoods referred to by Woods as sources of crime are majority Black and Latino. I asked Woods outside the council chambers to explain his theory further. “More money in workers pockets draws in the crime element from surrounding areas,” he said. He drew a diagram on a piece of paper, with arrows converging on a circle. The arrows are criminals moving in on the city with a higher minimum wage. UCLA’s Wong said there is no research indicating anything Woods said is true, and that if anything, studies show that when you lift people out of poverty, as minimum wage increases do, crime actually drops. Calls to Denny’s media relations office seeking the company’s official policy regarding local minimum wages, and seeking clarification regarding Woods’ comments about crime, were not returned. I reached Woods by phone earlier today and asked why he identified Inglewood, Compton, Watts, and East LA as sources of a "crime element." "It has nothing to do with race," said Woods. "Those are just cities that are near [west LA]." Woods added that it is not Denny's corporate policy to oppose local minimum wage laws. It should be noted that Compton, Watts, and East LA are nowhere near West LA. In 1994 Denny’s paid $54 million to settle a sweeping series of lawsuits brought by Black customers alleging racism. In more recent years Denny’s has paid millions to settle lawsuits alleging disability discrimination, and claims of sexual harassment against female employees in its restaurants. According to the Denny’s 2014 annual report, a substantial number of Denny’s employees are paid the minimum wage. Denny’s has approximately 7,900 restaurant workers, most of them at locations in the US. Denny’s CEO John C. Miller was paid a $750,000 salary last year, and granted stock and other compensation worth a total of $2,271,740.